During interviews I often get asked what my hobbies are. I always find it a weird question, but I guess they are getting to know you and want to make sure you can answer that question without any crazy red flags? It’s a difficult one for me to answer sometimes because for the last three and a half years I’ve spent the majority of my free time working on social media (it was the only time I had to do it). But luckily, I do still have a few other hobbies I make time for (bingeing Netflix obviously doesn’t count which is a sad truth because I am really good at that). Aside from reading and attending my awesome book club, running is my main hobby. When I look back on it, it is still hard to believe, and I feel weird if anyone ever refers to me as a “runner” although I guess technically its true? I run maybe 3 – 4 times a week depending on my schedule and have a goal to run 1000 km this year which is a pretty big deal. The main reason I find it odd is because of how much I hated running when I was young. During gym and cross training for swimming (that’s a whole chapter of my past life that we will probably never get into! ), I was forced to run for a certain distance or time and I hated it. I hated being sweaty and out of breath and not being allowed to go at a pace I was comfortable at. So, imagine my surprise when at the end of 2014 I decided to make a New Year’s resolution to run 1k. Now the backstory to that seemingly small goal is that a radio station in Vancouver used to hold a “1k to a Beer Garden” party where you would run and then there would be a concert and beer and you raised money for a charity and they always had really good bands. Every time I heard about it I had extreme FOMO, so I wanted to see if I could do it in 2015. I started running on a treadmill and could only do 0.1k without needing a break and man did my body hurt! But I kept at it and when spring arrived, I started running outside along the sea wall and discovered how good it felt mentally to spend time away from everything and just be outside in this amazing setting. 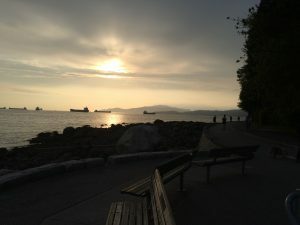 I found that taking time to run, especially after work, was a great way to emotionally deal with the events of my day. This is still true now. I have some of my best ideas while running when my mind is free to run wild (pun not intended). As 2015 ticked along, Sara and I realized that the radio station was not having their run this year. It was disappointing, but we decided to just hold our own event instead! 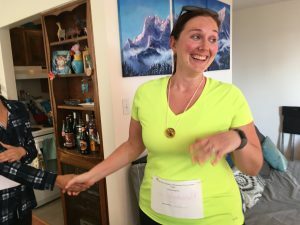 We called it a “1k Run to a House Party” and had people come, donate to the food bank and after running, had a big party. The first year was awesome! A ton of friends came, we collected a lot of food donations and we had fun running even though it was crazy hot out. A great time was had by all and so we decided to make it an annual tradition. 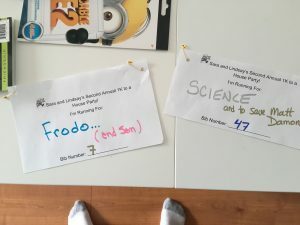 Every year since we’ve added a new thing like bibs for who you are running for or medals which have been fun ways to change up the event and personalize the run in a weird and humorous manner-plus stickers and chocolate! It really is just an excuse to have a party but with a unique twist that makes it different from normal house parties and a good way to burn off *some* of the beer and snacks we consume post run. We talked about this tradition in one of our podcast episodes last year right before we held it and, similarly, the fourth annual run is going to be held shortly after this blog goes up. 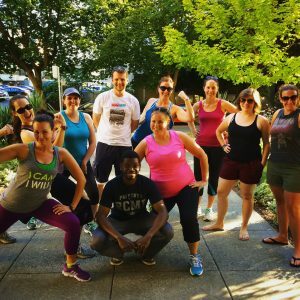 I really enjoy sharing this story with whomever I can because it’s an event we look forward to every year, one that runners and non-runners can both attend and at least in my mind, marks the start of summer. I will always look back at it fondly as the reason why I started running – and not just because I can now use it as a hobby example in interviews. I’m impressed, I have to say. Really hardly ever do I encounter a weblog that’s both educative and entertaining, and let me let you know, you will have hit the nail on the head. Your thought is outstanding; the difficulty is something that not enough persons are speaking intelligently about. I am very completely satisfied that I stumbled throughout this in my search for something relating to this. Hello there, I discovered your website by the use of Google while searching for a related subject, your site came up, it looks good. I have bookmarked it in my google bookmarks.